Considerable cloudiness. Occasional rain showers this afternoon. Thunder possible. High 71F. Winds NNW at 5 to 10 mph. Chance of rain 50%..
Cloudy with occasional rain showers. Low 56F. Winds NE at 5 to 10 mph. Chance of rain 60%. 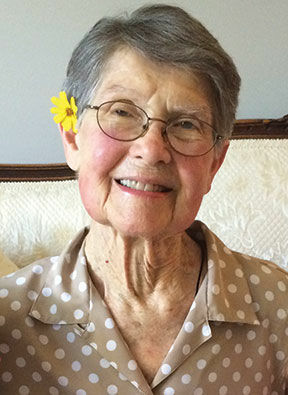 Doisy, Barbara, of Webster Groves, Missouri, was born July 2, 1921, in Canton, Illinois, to John and Maybelle (nee Thompson) VanDyke, and entered into rest Wednesday, Nov. 21, 2018, at her residence in Webster Groves, Missouri, at the age of 97 years, 4 months and 19 days. She is preceded in death by her parents, husband Edward A. Doisy Jr., son Edward A. Doisy III, son Robert Doisy, sister Betty Thompson, and brother in law Richard Ames. She is survived by two children, John (Charlotte) Doisy, and Richard (Kathy) Doisy; 14 grandchildren, Gina (Alexis) Molina, Sarah (Brad) Ashton, Emily (Garrick Jones) Doisy, Elizabeth (Johnathan Boyer) Doisy, Erin (Kyle) Robb, Kimberly (Rod) Wilson, Stuart Doisy, Kristina (Kevin) Fann, Justin (Annie) Doisy, Jenna (Karl) Kurtz, Rachel Doisy, Samantha Doisy, Josh (Ali) Qualy, and Jamie (Steve) Wynd; 16 great-grandchildren; one sister, Judy Ames; two daughters-in-law, Carla Doisy and Theresa Doisy; and many other family and friends. Barbara enjoyed playing cards and Scrabble, as well as painting and other art works. She liked to go fishing with her husband, Edward, and always took the opportunity to see her children, grandchildren, and great-grandchildren any time she could. She will be dearly missed by all who knew and loved her. Visitation Saturday, Dec. 1, 2018, from 12 p.m. until services at 2 p.m. at First United Methodist Church of Webster Groves, 600 N. Bompart Ave., St. Louis, Missouri, 63119. Interment at Oak Hill Cemetery. Memorial Donations can be made in honor of Barbara to First United Methodist Church of Webster Groves. Family and friends can review and share stories, photos and condolences online at www.stlfuneral.com, and follow details of this event and others in the community at www.facebook.com/stlchapelhill.